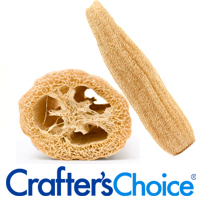 When most people think about “Luffa,” they believe it is a sea sponge. This is wrong! The Luffa Plant is actually a gourd which produces fruit! Commonly grown in the United States and Asia, people have been consuming the squash produced from the luffa plant for centuries. The luffa you find in cosmetic use, common for exfoliation, has actually been dehydrated for months. Most commonly, people purchase pieces of luffa for use in the shower. It’s used by adding soap and scrubbing the skin, but this can actually be quite harsh, more so, left alone in the shower, the luffa has the potential to grow mold, mildew, and bacteria. For these reasons, we created the After the Rain Luffa Soap. Using the melt-and-pour soapmaking technique, we added chunks of luffa directly into the soap, so there is no concern about the growth of mold, mildew, and bacteria because these microbes cannot grow on soap. Ideally, you would use a luffa soap for extremely rough or dry skin, such as on the feet. When used on the feet, it’s an amazing exfoliation of dead skin because the soap is naturally coarse and rough, helping to slough off the hardened, dried skin. A luffa soap can also be used to invigorate the body. An ancient technique, called “Dry Brushing,” usually requires the use of a bristle brush, but a luffa soap can almost be used in the same way. Using the luffa soap on areas like the hips, glutes, and back can create a deep scratching feel, which promotes circulation and can feel like a deep-tissue massage. Be careful not to scratch too deeply – if the skin is red, inflamed, stinging, or painful, it was done too hard, or the skin may be too sensitive for this kind of use. It’s normal for the skin to be slightly pink. Luffa soap is also excellent for areas where there are ingrown hairs, as the coarse features of the soap may help to loosen the skin blocking the hair. For this reason, using the luffa soap right before you shave (never your face!) can create a smoother, softer, closer shave. In any way you decide to use a luffa soap, always be sure to moisturize afterward to keep your skin soft and supple. I’ve felt incredibly old these last few months. Not because of my age, but my general well-being. I’ve felt extra tired, overworked, and this extraordinary guilt anytime I wanted to do something fun because there was either some responsibility I should be attending to, or I couldn’t justify spending the money because of some bill I should be paying. I decided I couldn’t live this way. I can’t change how much work I have to do because once I commit to something, I must give it my all (or there will be other unhappiness). Nor could I change how much income I have flowing in. So, I woke up this morning with a goal to be mindful about feeling young. Spend one hour a day doing something just for you. Whether that hour is spent getting a manicure, reading, taking a bubble bath, cooking, being crafty, I will do something just for my enjoyment. Step away from the TV. While I love television shows and getting wrapped up into their storylines, watching TV is doing nothing for my brain or my waistline. When I get home from my day job, I am exhausted and want nothing more than to go watch TV. But, I’ve decided I could spend that time being productive. Sing! I was stuck in traffic for three hours with my husband yesterday; it took us that long to drive 50 miles (gotta love New York City). We were both getting frustrated and started snapping at each other. So, I plugged in my phone, and started blasting tunes we both love. We started singing together and suddenly the ride wasn’t so bad. Eat at home. People who eat at least five home-cooked meals a day are 47% more likely to live an extra decade¹. I feel like I never have time to cook, but I know I can come up with something quick and much healthier than what I order if I just plan ahead. Self-acceptance. I’ve always struggled with my weight. It’s a vicious cycle, really; I feel depressed about my weight and don’t want to leave the house which turns into overeating. I realized if I accept who I am where I am, I will naturally make better choices. Anything worthwhile takes time. Listening to Hamlet, if we learn to weather the “slings and arrows of outrageous fortune,” we are sure to live a longer, happier life². Choose to Feel Younger. Don’t let yourself be controlled by three things: people, money, and past experiences¹. We can make the conscious choice to let go to actually gain control and feel younger. It was Spring Break here in Staten Island, New York this past week. While many of my fellow teacher friends were hopping on airplanes to Caribbean climates, I chose a stay-cation in my Staten Island soap lab. I finally had a full week to be super creative with my soaping! I chose to dedicate this week’s soap shenanigans to step outside of my normal soaping zone. I made soap with beer, soap with wine, Spanish Castile soap, soap inspired by the Arabian desert, and traditional African Black Soap with a recipe from Ghana. I started doing my research on African Black Soap several months ago when a friend told me his wife was obsessed with it. It goes by many names – anago soap, alata simena, and dudu-osun – and it all depends on which part of Africa the recipe is derived from. What’s interesting about African Black Soap is that no two soaps from different regions are alike. The reason is because it’s actually a tribal recipe, and the recipes that we have now were deduced from backward engineering, otherwise, they are tribal secrets. Secondly, the ingredients are solely based on what’s locally available; however, what each recipe has in common is an abundance of shea butter. This is an unusual method of making bar soap because bar soap normally requires sodium hydroxide while liquid soap requires potassium hydroxide – this is why African Black Soap is softer and more crumbly than regular bar soap. African Black Soap has many natural exfoliants and is generally slightly scratchy when using it. This makes it an incredible soap for troubled skin. Interestingly, even with the exfoliating component, it is also an excellent soap for sensitive skin. It’s generally just an excellent soap to use for people who are seeking a natural alternative for irritated skin. “Black” soap is a bit of a misnomer to the rustic appearance as it is really a variety of browns. Truly, because of all the natural, local ingredients, batches can extremely vary in appearance. The natural scent of this soap may not be appealing to many people as it smells a bit ashy, which is why I took my own twist on the recipe and added tea tree essential oil and lavender essential oil. Along with improving the fragrance, tea tree and lavender essential oils are also ideal for troubled and sensitive skin while maintaining the completely natural, synthetic-free state of the soap. The beauty of this soap is how simultaneously clean, fresh, and soft your skin will feel after using it. It’s clear to see why so many people are raving about it, but don’t be fooled by mislabeling. I’ve seen a lot of brands marketing their products as traditional African Black Soap but then reading ingredient labels that have SLS (sodium lauryl sulfate), which is an added synthetic surfactant. Read your labels, know your products. Why not grab a bar of Traditional African Black Soap and see what the craze is all about? I am CLAZY about clay. I became obsessed with clay when I started using it in cold-process soap recipes. Clay brings a natural exfoliant and helps maintain fragrance in soap, but there is so much more to clay. About six months ago, I started using excess clay to make my own face masks, and the positive skin results are undeniable. Clay is extraordinarily beneficial for sensitive skin, oily skin, and acne-prone skin. This is because clay masks, as they begin to harden, draw out excess oil and sebum from the skin making the appearance tighter, refreshed, brighter, and clean. “There are three phases of a clay mask,” McGlinchey continued. “There’s the damp phase where your skin drinks in the beneficial minerals from the outside. Then you have the start of the dry phase, which exercises your capillaries and stimulates blood flow as the mask cools and contracts. But then there’s the dry phase, which draws out moisture from the surface of your skin, causing dehydration and irritation.” Not only does skin then feel dry, tight, and sometimes itchy, but when you counteract it by slathering on extra face cream, you’re just smothering your freshly cleansed skin. When using your clay mask, you never want it to become completely dry because then you’re drying out your skin far too much. It’s important to maintain a healthy balance of sebum on your skin to keep your face moisturized, but more importantly, to protect your skin against environmental damage. A clay mask is most beneficial when you have tired and over-worked skin, such as wearing make-up or sunscreen all week. You want to use your clay mask no more than twice per week. A clay mask is also beneficial to use when you start to notice a normal break-out. I’m stressing normal break-out because most break-outs are the results of hormone shifts…and skipping washing your make-up off (which you should never do). If a break-out is abnormal (and you know your skin), or lasting longer than usual, definitely consult a dermatologist. But what about skincare for the 45+ gorgeous person? Clay masks are perfect for this age group, as well. Most people in the 45+ age group are not suffering break-outs, but instead, are facing skin that is a little less resilient. Clay masks are beneficial for this group because it tightens pores and draws blood-flow to the skin. The extra circulation in the face is what promotes the rosy color and oxygen flow. Blood carries nutrients, water, and oxygen around the body, so anything that increases circulation (like a vigorous workout), helps bring all of the benefits to the skin. After rinsing off your clay mask with cool-to-lukewarm water, be sure to pat dry your face. Patting your face dry is always how you should dry your face to prevent pulling and yanking on your skin. Follow-up with a serum and/or moisturizer to replenish healthy oils and make your skin glow. We recommend Evanescence for a full facial treatment. A few final recommendations when using Saving Face: Be sure to start with fresh, clean skin and a dry face. Finally, don’t overwork your skin by exfoliating on the same day. Alternate between Face the Day and Saving Face throughout the week to give your skin a chance to rest. In the video below, I am demonstrating how to use Saving Face, our clay mask. If you have any questions or skin concerns, I am always happy to answer – just leave them in the comments below! In the natural beauty world, there’s an overwhelming fear of “toxic” chemicals. The more I learn and grow as a chemist and person, the more I have discovered that chemicals are not the toxicity to fear, but toxic people are. A toxic person is someone who draws out your positive energy. They’re always negative and they try to draw you into their darkness, or they try to make their darkness surround you. The old adage is true; misery loves company. The bigger problem with toxic people is not that they exist, but that they use their parasitic negativity to feed on doubt and self-consciousness. We’ve all experienced these kinds of people. Sometimes they are trying to bring us down with them and sometimes they’re just trying to knock us down. Whatever their motivations are, and it’s usually their own lack of stability and doubt, we must push forward beyond them. Feed your cheerleaders. For as many toxic people that exist, you will find your cheerleaders, as well. Focus on those people who are cheering you on. Listen to criticism, but ignore critics. True constructive criticism is pivotal and necessary for all of us to learn and grow. No one is perfect. But people who spend their time criticizing without any constructive purpose are toxic and should be ignored as white noise. Get yourself out of toxic situations and relationships. The best way to make a parasite die is to no longer give it a host to feed on. When someone is toxic, excuse yourself from the conversation, and if it’s a long-standing relationship, just continue to make excuses to get out of being with him/her. Don’t try to argue – this just feeds them. Become a rubber ball. For as much ignoring as we can do, sometimes we absorb negativity and start doubting our own self-worth. This is when you have to be a rubber ball and make it bounce off of you. If you’re working hard and doing the right thing, do not allow that negativity in; trust your value. Carve out your roads. Toxic people cling to those who they believe lack direction and focus. If you create a clear path to your goals and vision, then there is no time to stop and allow naysayers to veer you off the road. When in doubt, just keep putting positivity into the world. The right people will always be in your corner and the negative ones will run from your light. Your money is incredibly important. Not as important as your health, happiness, family, or friends, of course, but it’s up there. We get that. It means you worked hard to earn it and you chose our products to spend it on. It’s a responsibility we don’t take lightly. So when you make a purchase from us, we understand what that means. We want you to take a trip with your dollar from the moment you spend it with us. It has many possible paths, and often divided amongst the crowd, but we want you to know where your money is going and what that means to us. To rescuing animals. Our mission and passion have always been living a cruelty-free lifestyle, but we like to put our money where our mouth is, and we support animal rescue organizations. So, your dollar could be feeding or fostering your future furry family member right now! To the government. We pay for certifications and licenses to ensure our business practice is legal, safe, and following protocol. We also pay our taxes! To our insurance. We want to make sure you always feel safe and secure (and we want to feel safe and secure) so we carry liability insurance. To our lawyers. We’re always trying to do the right thing in the right way and that costs mucho moola. To our photographer. We like to pay for pretty product photography because we’re not very good at it. We don’t mind – our photographer, Bryan Maes of Inspiration Studios – is another small business owner in New York, and we like to support local business. To our suppliers of raw materials. We’re very careful about our suppliers to ensure we stay compliant with our Leaping Bunny certification, so we choose only the most reputable suppliers with the highest-quality ingredients available. To Kristen’s classroom. I’m a teacher by day and I often need some extra supplies to make my classroom fun and functional. I use extra spending money from our business to fund my class ideas. To research and development. We test all of our products and formulations profusely before putting it to market, and buying supplies for that can get quite costly. To fund free shipping. We’re proud to offer free shipping on orders over $49, and we use our profits to pay for that shipping. To book vendor events. Maybe we event met you from one of our vendor events? Getting out there and into the community is so important to us. We get to know who you are, what your needs are, and what you care about. To pay for our website. Our website costs include a monthly fee as well as a per-transaction fee. To keep everything functioning, we need to pay the web company. We also occasionally pay for some design help through Dean Pagliaro of eCommerceDean – another local small business! To pay for our first home. We purchased our first home in August 2016 and we’re so thankful for your support which helped us get there. We’re now able to have a dedicated lab and office to run our business right from our home. To community fundraisers. We often donate funds or goods for local schools or not-for-profit organizations looking to fundraise for their cause. When you make a purchase from us, your dollars travel far and wide, and often right back into your goods and your community.